The Sparks longtime core: Candace Parker, Nneka Ogwumike, Kristi Toliver, Alana Beard and Jantel Lavender, with coach Brian Agler. Photo courtesy of WNBA. 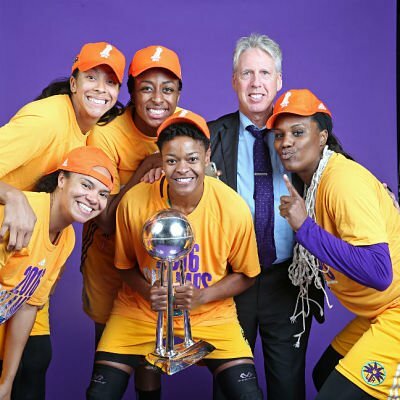 In claiming the trophy, the Sparks ended a 14-year drought between Championships – the longest such gap in the league for any team in its history. And that journey proved to be more difficult and arduous than anyone could have predicted. A team who seemed formidable in its early years just won a series in which they were the underdogs – so much so that some of their own fans didn’t think they could pull it off. 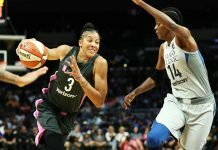 They beat the three-time champion Minnesota Lynx on their own home floor, in front of a playoffs record 19,423 fans who were yelling so loud that Sparks players could barely hear one another on court. This after an 11-0 start to the season and a first or second-place standing in the league all year long. If it all seems surreal to everyone involved, it is because the last decade and a half has been nothing short of tumultuous for the Los Angeles franchise. Candace Parker and Alana Beard absorb their Western Conference Finals loss to the Minnesota Lynx on Oct. 7, 2012, in the post-game press conference. Photo by Sue Favor. The Sparks were one of the cornerstone organizations in the original eight-team line up of the WNBA, and played against the New York Liberty in the league’s 1997 debut game. As the Houston Comets grabbed the first four league Championships, Los Angeles kept growing, and blossomed in 2000, when they saw a record year that culminated in a title loss to Houston. The next two years then belonged to the Sparks. Lead by the dominating play of center Lisa Leslie, they collected back-to-back titles, and are still the only WNBA team to have pulled off that feat. 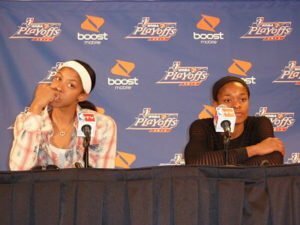 Candace Parker and Alana Beard listen to a question in a press conference after losing in the Western Conference Finals in 2012. Photo by Sue Favor. In 2003, Los Angeles lost to the Detroit Shock in the Finals. The following year, longtime coach Michael Cooper resigned to take an NBA coaching job. The team lost in the playoffs to the Sacramento Monarchs, and the following year had a mediocre 17-17 season. The 2006 season saw the Sparks return to a winning record, but their season ended in the playoffs at the hands of the Monarchs for the third straight year. In December the Buss family sold the franchise to founding fans Carla Christofferson and Kathy Goodman. They brought back Cooper as coach. The 2007 season was arguably the most difficult in team history, as Leslie sat out after having a baby mid-June. The Sparks went a franchise-worst 10-24 and missed the playoffs for the first time since 1998. The silver lining in the poor year was that Los Angeles won the first pick in the 2008 draft, which they used to acquire Tennessee All-American Candace Parker. 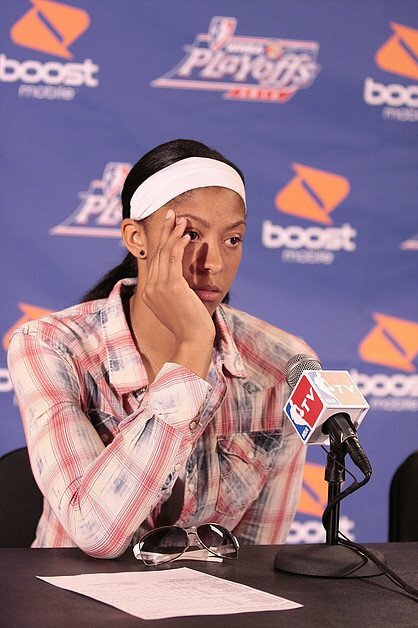 Candace Parker speaks to the media after the Sparks lost to the Lynx in the Western Conference Finals on Oct. 7, 2012. Photo by TGSportstv1. With Parker came a lot of excitement, anticipation, and expectations. Known for dunking in college, Parker threw two down at Staples Center during the regular season. There were continual fan events, and the home crowd atmosphere was electric. But Los Angeles lost painfully in the Western Conference semifinals to San Antonio that year after Sophia Young scored with 1.3 seconds to go in the second game, and the Stars came back to win game 3. In January, 2009, Parker announced she was pregnant. A few weeks later, Leslie said she would retire at the end of the season. Parker had her daughter in May, and Leslie sustained a knee injury early in the season. Neither player returned to the court until July. They guided Los Angeles back to a winning track, turning an 8-14 start into an 18-16 finish and clinching a playoff spot. 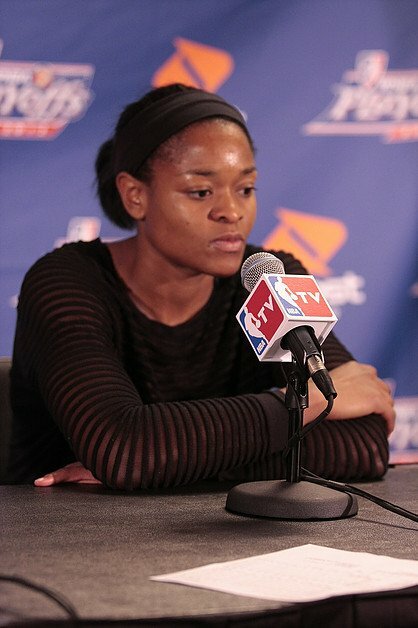 Alana Beard speaks to the media after the Sparks lost to the Lynx in the Western Conference Finals on Oct. 7, 2012. Photo by TGSportstv1. 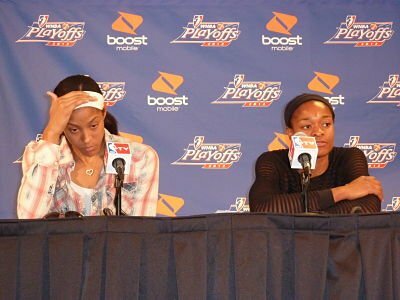 But the Sparks faltered in the conference finals, losing to the Phoenix Mercury in three games. The enduring image of the game was Leslie and Parker standing on the sideline in the waning seconds, Parker in tears with her arm on Leslie’s. Cooper left the team again, to coach USC women’s basketball. The 2010 season was promoted as a baton pass year for Parker, as it was now “her” team instead of Leslie’s. 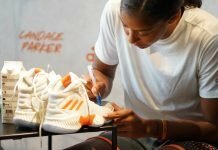 But on June 13 – ironically, in a home win over the Lynx – Parker dislocated her shoulder, re-injuring it from her senior year with the Lady Vols. She had to have surgery and was lost for the season. The Sparks struggled to a 13-21 finish and lost in the first round of the playoffs to eventual champions the Seattle Storm. The following year was strangely similar to the previous one, with Los Angeles beginning around .500 before Parker was injured. This time it was a meniscus tear, which kept her out almost six weeks. They failed to make the playoffs. 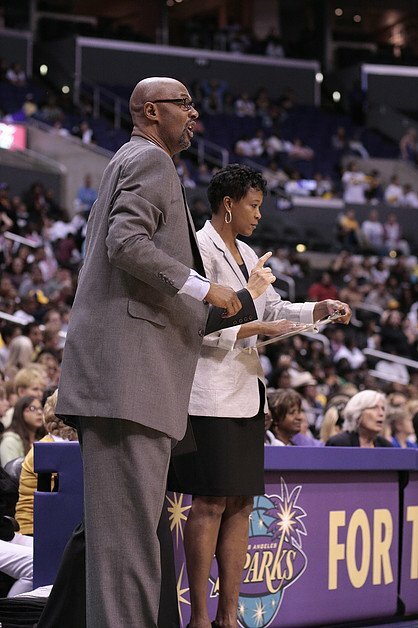 Joe Bryant was assistant coach to Jennifer Gillom in 2010 and 2011, until she was fired that July. Bryant filled in as head coach for the rest of the season. Photo by TGSportstv1. The 2012 season injected excitement into the franchise and fan base, as they took Nnemkadi Ogwumike with the first pick in the WNBA draft, and saw Parker play a full season for the first time since she was a rookie. The Sparks powered through the first round of the playoffs but were swept 2-0 by the Lynx in the Western Conference Finals. The second game ended after a fierce battle that saw Los Angeles guard Alana Beard throw up a shot at the buzzer that hit the rim and bounced out. Minnesota won, 80-79, after which Parker walked into her mother’s arms, in tears. The Sparks lost to Phoenix in the first round of the playoffs both of the next two years. The 2014 season, in particular, was sporadic for the team, which would alternate winning and losing streaks seemingly without regard to what team they were playing. At times, for instance, they’d beat an opponent with a better record and then lose to a team with a worse one. This was especially perplexing considering that Parker was drafted in 2008, Toliver acquired in 2010, Jantel Lavender drafted in 2011 and Alana Beard and Ogwumike both came to the team in 2012. 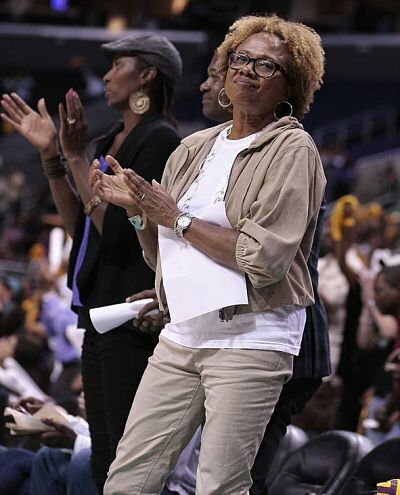 Paula Madison and Williams Group Holdings owned the Los Angeles Sparks from 2011 until December, 2013, when they pulled out of their ownership interest. Lisa Leslie, left, was part of the group. Photo by TGSPortstv1. They have been the mainstays in an annual tradition of replacing Sparks players. The rosters over the years could make up several All-Star teams, as Teresa Weatherspoon, Chamique Holdsclaw, Ticha Penecheiro, Tina Thompson, Betty Lennox, DeLisha Milton-Jones, Lindsay Harding, are among many others who have suited up for Los Angeles. Tumult took place off the court, too. In 2010 Jennifer Gillom was hired as head coach, and was fired in the middle of the following season, after which assistant coach Joe Bryant took over. Carol Ross was hired as head coach in 2012, and won coach of the year that season. She was fired during All-Star weekend in 2014, and general manager Penny Toler served as coach for the rest of the year. Williams Group Holdings took over ownership of the Sparks prior to the 2011 season, and abruptly released ownership interest in December, 2013. For a while, it looked as if the franchise would dissolve, as others had before it. 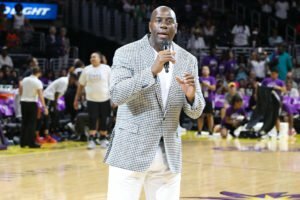 But in February, former Los Angeles Laker Magic Johnson and his ownership group bought the Sparks. 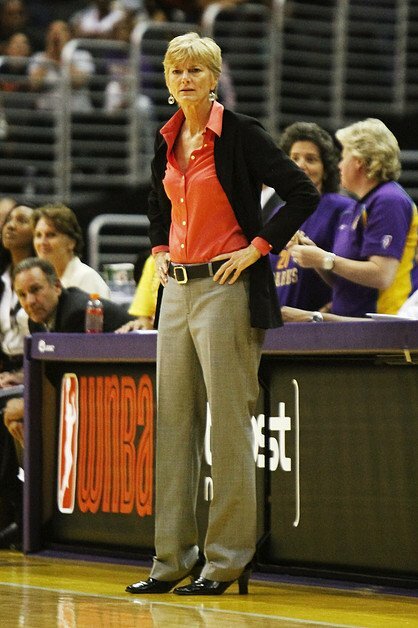 Carol Ross was named WNBA coach of the year in 2012, and was fired by the Sparks two years later. Photo by TGSportstv1. Last year began with Parker announcing she was taking the first half of the season off to rest after years of playing year-round. Los Angeles lost their first seven games and then went on a five-game losing streak shortly thereafter. 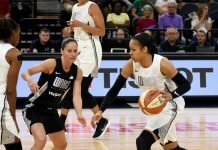 Parker’s return ignited a comeback, but again, the Sparks went out in the first round – this time to the eventual champion Lynx. With that script in hand, Los Angeles marched into this season a changed team. They didn’t talk about what they’d do; they just focused on one game at a time. They won, and kept winning. They fought all the way to the last second of the last game of the WNBA Finals, and they came out winners. If fans are having a hard time believing it after so many years of disappointment, you’ll have to forgive them. Founding Sparks season ticket holder Aida Diaz said the 2016 title is still sinking in. Diaz said she has been invested in the team since day one, but it hasn’t been easy. First the Sparks had to build to surpass the Comets. Then there was heartbreak in not clinching a third title in 2003, but hope that they’d return to the Finals soon. That hope turned into questions over the years. 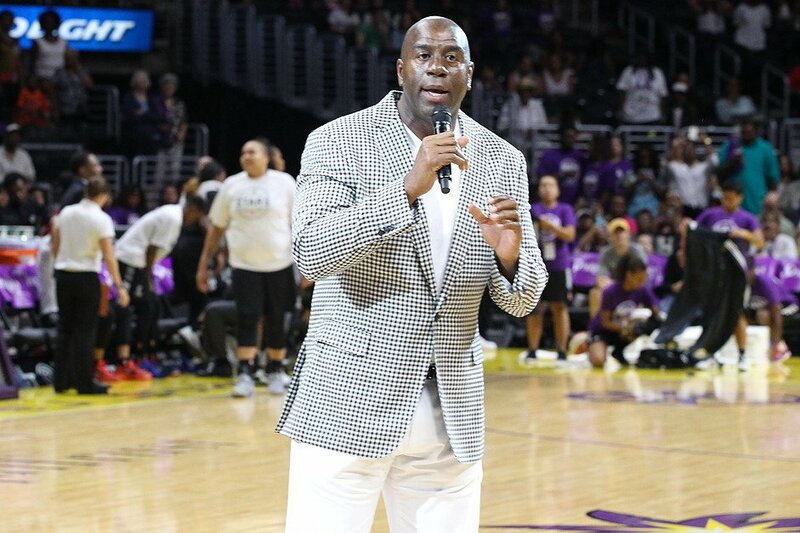 Magic Johnson is part of an ownership group that purchased the Los Angeles Sparks in January, 2014. Photo by TGSportstv1. Gail Russell, also a founding Sparks fan, has similar reasons for continuing to stand behind the team through tough times. “I love basketball and wanted the league to thrive,” Russell said. Diaz said she cried along with Parker after the Championship win. Russell said it is sweet to see the Championship return to Los Angeles. The seeds of the Championship were sewn in a different approach this year. For the first time since Parker was drafted, the franchise didn’t declare prior to the season that they would win a title. This undoubtedly took pressure off players. Athletes became more honest with each other, and made a decision to work together as a unit. Agler was up front with the team when they went through a slump, telling them they weren’t the best team in the league anymore. It woke them up to finish the season strong. And in every post-game interview, when players were asked to look ahead on the schedule, they’d say they were just focused on the next game. Agler repeated that mantra too. Diaz said her doubt turned to belief during the season. It’s the mindset of champions. And it came at the end of a very long, winding road of growth. Great article!! I could sense the change in this team this year as well and knew it was the year they’d take it all. I’m so proud to be a fan of the Sparks! Thanks so much! Hope you get a chance to see that epic game on replay. Feel free to tweet or post this story wherever! Marlene, I’m so sorry for your loss and too am thankful for how many times throughout the years, this team has been a beacon of light, portrait of perseverance and a rainbow indeed. Take care!